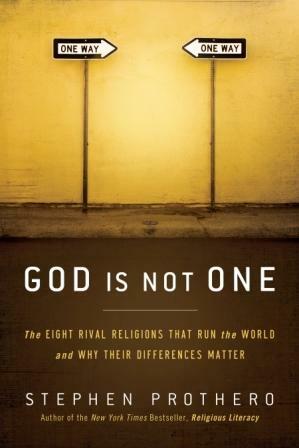 God Is Not One: The Eight Rival Religions That Run the World–and Why Their Differences Matter, Stephen Prothero, HarperOne, 2010, ISBN 978-0061571275, 400pp. This is no self-help book. The goal here is not to provide a menu of religions so you can choose one to feast on for the rest of your life. Instead, it’s the classic college assignment of compare/contrast, and in every case Prothero does a great job of doing so, and doing so in the context of each religion. That is, he uses the terms of the religion itself when doing the contrasting, rather than always comparing with his own upbringing. Prothero does insert himself in the book, and it is better for it. It’s important to know that he was raised in the Christian tradition, but also to know that he’s attended Seders and has friends and colleagues in all these fields. His goal, beyond the thesis, is that by understanding the beliefs (or non-beliefs, as the case may be) of others, you are better suited to get along with them, and it certainly seems like he is a model example of this. I come away from this book with as many questions as I went in, albeit ones that are different and more nuanced, more than likely. For one, I’m not sure that it is entirely possible that all these religions can co-exist peaceably, at least not under traditions that proselytize and seek converts, or where zealots seek to modify others’ behavior based on their religious convictions. In this sense I do side with the New Atheists who feel that by allowing religion to enter the public, political realm is a clear and present danger. But Prothero is spot on to point to New Atheists being as starkly fundamentalist as the worst of any of the extreme wings of any of the religions, and that’s enough to give anyone pause about their statements and goals. This was the first book that I have read completely on my iPhone, and I very much enjoyed the experience. I didn’t use the ability to make notes on the text outside of marking one typo, but I’m looking forward to taking advantage of that feature in the future. One time I did “lose my place” in the book, but finding where I was again was as easy as with the paper version.